The dental consultation is our effort to take time to discuss potential problems, estimated costs and to provide useful information for owners to make good decisions. Every question is answered to the best of our ability. Most pet owners are worried and have questions about various aspects of their pet's surgery and recovery. Anesthesia safety, pain management the cost of services and payment plans are are all valid concerns. We hope this website information will make your decisions in the care for your companion less difficult. Please write down any questions you have so they are appropriately addressed during the initial consultation. Your family doctor refers patients to us because we are ideally set up to provide the necessary care. We will always act in the best interest of your pet. To ensure excellent communication between our team and your family veterinarian, please have your veterinarian fax a completed referral form to 920-233-1956. If you do not have a family veterinarian, please fill out a new client form and fax, mail or bring the form with you to the initial visit. How do I prepare my pet for the procedure? multiple contact numbers for yourself and other decision makers. 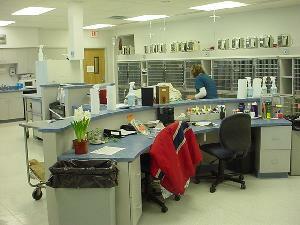 Our staff is focused and devoted to your pet's welfare. They are highly trained and very well equipped to help monitor and respond to your pet's needs while under anesthesia. We utilize the highest quality anesthesia monitors to maximize safety for your pet. Fluid therapy is administered briefly before, during and after the anesthesia period for the comfort and safety of your pet. Warm water blankets are placed under your pet and warm air blankets over them to help keep them warm and comfortable. Preanesthetic blood testing is important in helping us identify your pet's problems, and special needs. This ultimately reduces some of the risks associated with anesthesia for your pet. Healthy animals can have problems that can only be detected with blood testing. If there are problems, it is best to find them before anesthesia is planned. Specific anesthesia protocols can address your pet's specific needs and allow for special patient monitoring. If serious problems are detected, surgery can be postponed until after the problems are corrected. It is important that surgery be done on an empty stomach to reduce the risk of vomiting during and after anesthesia. You will need to withhold food for a minimum of 8 hours and preferably 12 hours before anesthesia. Water can be available for your pet until the morning of surgery. For oral surgery, we use absorbable sutures that will not require removal. Some surgeries, such as in oral cancer cases, do require non-absorbable skin sutures. These will require removal by your family veterinarian or by our staff between 10 to 14 days after surgery. For most oral surgery cases, you will be asked to feed soft foods and withold hard treats, rawhides and toys for two weeks. Anything that causes pain in people can be expected to cause pain in animals. Pets may not show the same symptoms of pain as people do; they usually don't whine or cry, but you can be sure they feel it. Pain medications needed will depend on the surgery performed. We will prescribe appropriate pain medication for your pet. Please be sure to give the medication as directed (the correct amount and at the correct interval). It is very important that you do not administer any other medication than those prescribed, because drug interactions can result in very serious problems. 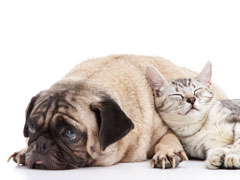 Please call us if you have any concerns, especially if you feel your pet is experiencing pain. Consultations can be scheduled as a separate appointment, or together with the scheduled procedure. Separating the consultation allows you to consider and discuss your options further with friends and family members before proceding. The advantage of scheduling the procedure on the same day as the dental consultation may be more convenient for you, and faster in treating your pets' painful conditions. These decisions are yours to make based on your concerns and needs. We respect your needs and recommend serious considerations of these issues before scheduling. We ask that you keep your scheduled appointments, and to be sure to withold food as directed before surgery. When you bring your pet in for surgery, we will need 5 to 10 minutes of time to fill out paperwork and make arrangements for telephone communication. Please have your work and cell phone numbers for yourself and significant others that may help make important decisions with respect to your pet's care. When you pick up your pet after surgery, you can also plan to spend about 10 to 20 minutes to discuss your pet's home care needs. Don't worry, we will also provide written instructions to help communicate with family members and other concerned individuals.